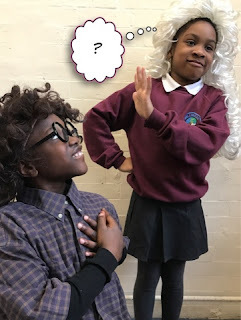 KS2 @ Hill Mead Primary, Brixton: Suitable suitor? Lord Capulet agreed to the marriage of his daughter Juliet and Count Paris (a relative of Prince Escalus). At the family party, Paris tried to woo and win Juliet over. What do you think Juliet thought of Paris and his efforts to romance her? Write a short paragraph in role as Juliet explaining how you felt when Paris came up to talk to you at the party. Juliet must of thought " I don't won't to marry you! Urh why do I even need to marry you! Why dad why do I have to marry Paris?!" But why, explain why Juliet would not have wanted her father to play match maker Melissa.
" Oh no that annoying man always wanting to marry me I need to find a way to run away! I could run to my bedroom and hide in the closet! Or if he knocks I could hide under the bed.... I know I can grab some food, Water, 2 blankets and a pillow and stay there with the door locked and he can't come in but I should do it in my bedroom toilet not the other ones because overly they need to use the toilet! Okay I'm ready to do this but I have to run!" I think that Juliet doesn't like Paris because Juliet likes Romeo even though Romeo killed Juliet's cousin Tybalt that doesn't mean Juliet has love in Romeo. Juliet does not like Paris she does not want to marry him she wants to marry Romeo. But this is before Juliet has even met Romeo Destin. Try again and remember to write in role as Juliet. I think Juliet doesn't want to marry Paris because he is a bit annoying and he always wants to dance with Juliet . Juliet maybe thinks that if he wasn't here she could of decided who ever she wants to marry and mabey her father Lord caplet could of never tried to make Juliet marry Paris. Try again Jada, remember to write in role. I think guilet wasn't interested in him because she knows that it was her dad and he gust wast to be more powerful and rich and when he gets all that powerfulness then he will think that he rules the world well guilet is not going to let that happen because she doesn't won't marry Paris but guilet thinks it's all going to be ok because she has advice from sister lorence .But guilet feels nervous still because she thinks any thing can happen at a split of a second so you know what I think she is going she is going to take the advice what sister lorence talld her she's going to hide the ring and fake the marriage wile the spit boy,sister lorence and the ners will find remeo and get him and bring him back to the village and hide in the showdowns and they can speak in secret again to be continued. I felt scared and why did Paris came I was shocked to see Paris and I don't want to marrie Paris. I told my dad that I don't whatnot to marrie Paris. So he said I will find a man for you. Urh why do I need to marry this man?! He is not the person I won't to marry I won't to marry someone that I like not someone that I hate. Dad please please please!!!!!!!!!! I'm also whay to young when I'm older I can marry someone that I love. Do you won't me to marry a royal person just so that if we have children your grand children could have a Royal blood line well,no I'm not going to marry him HE IS NOT MY TIPE! I wish I can just find someone that I love by myself like the other people. Urn if only. I think my own dad should not be making me marry some one that I do not love at all. I do not even think that I should marry him just because he is related to the prince. I can't even look at him for a second . So if I cant stare at him, why should I even say I do to him. I fell so trapped. Lovely Esther. What will you do about this? I will make sure that I do not get bossed around I am old enough to decide what I want. I do not need my father all ways around me he can't de around me fore ever . He can't all ways force me to do this and that I am not little any more he needs to start treating me like an teenager and not like a little kid . Sometimes I feel like he doesn't care about me so why did he tell me I'm going to get married so quickly? Why my dad trying to make me marry this horrible man Paris. It feel to marry someone else not this man why my dad had to do this to me it feel heartbroken. What has my Father done , is he trying to do this on purpose?! What is going on in his head! I don't even like Paris! I bet father is only doing it to get his hands on more money! I bet even Paris thinks I'm devoted to him but no, all he's going to care about is his bewitching good looks but to me he doesn't look good at all. Paris thinks I love him but I don't because he is just a arrogant non caring man, even if we had children he wouldn't care for them at all. Why would my father force me to marry a man who won't even care for his children!!! Has my father gone mad. Paris might be able to pull it of in front of his cousins subjects but he won't be able to pull it of for me. I would rather marry a man who has been arrested than Paris. I don't know who to turn to. Can't Paris get lost because I'm not into him at all because when we're proper adults to me he will look like he has done a bit of helping in his life. Lovely work Ellie. Juliet certainly seems to be no push over! How do you know Paris doesn't love you Nassim? What did he say to you to make you think that? He said: "What say you to my suit?" and then I knew he was using me. He wanted to be powerful by marrying me. I think my dad is taking over my life. Because he didn't think to ask me if I wanted to marry Paris. I think I should be the one to pick who I marry what a creep thinking. I'll marry someone I've never meet in my life. I feel like I should tell him I'm not marry someone when. It's been arranged marriage. When someone is pushing. Someone to marry you I can't even say I love him in his eyes. I really don't wont to marry that creep . My dad arranged the marriage already it seems like he just wont's the money . My life is going to change I can't even make eye contact with him. What did Paris say to you when he approached you at the ball Tae'Jah? Why was it so creepy? He came out closer to me like he was about to kiss me and said "What say you to my suit." He sounded so creepy . Urn why do I have to marry this man?! He is not my tipe I just don't like him I won't to find someone that I love BY MYSELF!!! Please please please dad don't let me marry this man, I don't like Paris does he won't me to marry Paris just for money? Or if we have children his " grand children" could have a Royal blood line well I'm NOT GOING TO MARRY HIM!! If only I could find someone to love by myself. Urh if only. I am not happy with my dad why wood he give me a person that i don't like. He thinks is okay but it is not okay just because he has money he gose around the road and look for a man to give me I am not having that. I don't even feel confident for this man how's about to marrie me that man might have to look for a naver wamman not me because I don't like you. This creepy dad how dare you I'm not happy . Why would my Daddy even try to make me interested to this man Paris.paris is kind of a fool all he is doing is to make me in love of him.maybe my dad wants to have more money than he olredy have . He looks so happy that I am going to marry Paris the son of prince Escalus.He thinks that I am going to fall under his foot and beg him for a marriage well he is wrong.enyways why would my dad even make me marry a man that I am not entrusted about! Is it 'fall under his foot' Assia? I mean that to be swooped by his charm and beg to marry him. I think that I do not deserve to be marred to Paris because all he cares about is himself and how he looks. He thinks I will fall at his knees and beg him to marry me but no way! I have a secret crush on Romeo Montague. If only he wasn't from that family, then we could be married. But I won't give up just yet. Maybe I can persuade my father that Romeo is not a bad man. Now if only this creep Paris would just go away! This creep is going to make me Mary Paris and I already like someone of my own wich is Romeo.I don't even know Paris that much so maybe he wants e to Mary Paris because he is related to the prince so Paris and Lord Capulet will get rich.Lord capulet thinks he is the boss of me and make me Mary who he wants me too and it is not fair so I am going to tell the ners to incuridge to let me Mary who I want and that is why I am going to get secretly married with Romeo because he is a montague it shall be a secret forever even though I am never going to mary Paris. I think that it is not fair that my dad is forcing me to marry Paris. my dad is so annoying I don't want to not talk to him. my dad can't always control me I am his daughter. I do not be control by my dad. I will speak to my dad and tell him that I can't always be control by him because I can do my own stuff myself I am not a servant I am his daughter. and I sertanly don't want to marry Paris. it is like I am always trap I can't do. My own stuff have fun be relaxed my dad is not controlling me so I will never marry someone else as long as I live even Paris. I can marry the person I like I can do everything I want instead being controlled all the time by my dad Lord capulet. why would my own father arrange a marriage with a person I don't even love. I cant even look at him In the eye because how selfish and arrogant he has been between me, only If I could talk to someone about this they would understand except my father. I'm also still married so this whole arranged marriage is going to make me actually make a crime..... Romeo Is the person I love only till I new that he killed my beloved Tyblat. After he killed his... friend. I never know were to look when I'm around Paris he makes me feel uncomfortable every time i wish this wedding never happens EVER. I think Paris is a ugly,backstabbing cowed! I hated that party yesterday night! Because why did my dad choose PARIS for me to live forever with! Anyway all he thinks about is himself, it's just so selfish! Ugh!!!! Why is Paris a backstabbing coward Rafaella? Think again, there are other reasons why Juliet does not want to marry Paris. Because he only wants me to fall for him but im not even into him I dont know why he would be so selfish. Why does my own father think he can just marry me off like that! It is always arranged. Every time. It's so typical of him. Paris... even saying his name makes me uncomfortable. He thinks he's all this, all that. If he thinks I'll fall at his feet (which actually stink) he is so very wrong. I would rather run away to the Montague House than marry him. He is so selfish and arrogant, he should marry himself! Just because the man is related to Prince Escalus, doesn't mean he HAS to marry me. I mean, there are plenty more fish in the sea. This is going to be a crime as well! You can't marry two men at the same time. Romeo is my love, and I will not stand for this! Marrying someone I don't love! It'd be mad! But I NEED to find a way out, or I will be arrested. I think that Paris trying to woo Juliet will go very wrong. He'll probably think out loud and say " Just fall at my feet already. I need to marry you!" Then Lord Capulet... will go on with the marriage because he needs the popularity. Do you want I foult of Paris he is ugly wimp my father is always wrong at everything. Always trying to impress me like I even care why dose my father know how hart breaking I haven't even known him for long time. A good start Deborah. Now think about what it is Paris did when he was wooing you that made you feel so disgusted. He looks so disgusting with his ugly trousers. He made me feel so disgusted that he wanted me to marry him. How unfaithful is he. i cant believe he is going to make me Marry someone i don't even know that much he is not handsome and I already like romeo as my secret husband and my own father is going to make me Marry Paris there must be A reason why he wants me to marry him maybe it is because he is related to the prince. l think that thought of paris not intersing she really hate and she don`t want listen he father and not to marry paris and my father do to me she don`t want to marry paris and she don`t want listen her dad she want to marry someone else instead of paris. Try again Boston. Remember to write in role as Juliet. I can't believe that my father wants me to marry Paris! Paris isn't interesting, he is to ugly for my type.I really hate him and my father. Why is my father making me do this? Something's up and I'm going to find out what it is. What should I wear is my makeup right is it right for me to like him should I break up with Romeo Should I even go to the party ugh there is so much to think about. Deep breaths this is another normal day or is it this is the day that would decide my life what should I do. Maid tell me what to do." Don't worry about it you should be fine Romeo is history and you haven't met him yet. You will see if you like him tonight." Where's Paris I have to see him to decide my life " hello Juliet I'm Paris" you're ugly. I regect you even if I haven't known you for long your just to ugly and no one can replace the man I really loved. I don't know why I got all excited about you. What should I do I wish I could live with mum she will know there I come from. Dad ses I should stop complaining about getting married. One day the time will come but not today I don't like Paris and will ever love him. What should I do!, I know i like him but I will never marry him and i don't care what my dad say I just won't marry him! But if I don't marry him there might be punishment would be declared and by the way i'm in love with someone else romeo what A romantic name. So it's Romeo then punishment or it's Paris then happiness to all it's hard to choose but no one stands against my true love. I think that she is thinking he is not the write one for me so what should I wear I've got to put makeup and do my nails and put my lip balm on I don't even want to go with paris he doesn't sound good. But I'm steel am happy for tonight I might even have the most fun than I fault. Were is he I just want to make my life all calm . Hi juliet i' m paris urrrr I wouldn't want tyo be with you your ugly I don't want to go with you I'm paris though your to ugly I don't want you. Why should I marry you? Your just not right person for me look at you your just not the person that I would want to marry. there are lots of people for you. father why are you makeing me marry paris I love romeo . oh that folish boy called what his name .his name is romeo . are that his name . mum father is makeing me marry paris.oh my sweet dother your father is make you have the love of your life . why do you gas what me to marry paris, he did not kill your cosine . but I dont lik paris gust becausehe did not kill my cosine that dos not mein that I have to marry him .you are marry paris AND NOMORE CWAOTONS . I can't believe that paris is trying to win me over he's married is horible he's not even trying i'm never saying yes to him there are more people in the world for him but why is it me he's not my tipe of guy i like one who act silly but nice at the same time the reson there doing this to me is because paris is prince escukes nephew.